In between contacting banks for this article, I made a quick trip to an ATM to pull out cash for lunch. Hungry, disoriented, and busy jumping between WhatsApp and Instagram, I forgot the debit card inside the machine. I only realized the next day when I tried to make a last-minute purchase and found an empty slot in my wallet—cue mini panic attack. But like many banks, mine provides a 24-hour call service, so I was able to cancel the card in minutes and ask for a new one to be sent to my branch. I used my other card to buy what I needed by tapping it on a little machine and was good to go—crisis averted. Walking to my car, I used my bank’s mobile app to pay a credit card bill and was on my way. Just a few years ago—pre-widespread WhatsApp and Instagram distractions—I probably would have been more focused on the ATM transaction in the first place and not forgotten my card. But if I had, it would have taken a lot more time and effort to cancel the old card, ask for a new one, pay a bill, and make a quick purchase. Today, each of these actions takes moments. Recognizing the impact of consumers’ constant connectedness, banks are continuously adapting their products and services for a new generation of tech-savvy, impatient multitaskers, as well as older generations that are using such services to complement their increasingly hectic lifestyles. Customers’ ongoing demands for convenience, speed, security, and luxury are driving Lebanese banks to provide services with more and more advanced technology. Banks’ mobile apps allow users to conveniently make transactions on the go. Contactless cards let customers pay by tapping their cards to contactless-enabled readers, instead of swiping or inserting them and using a PIN. These transactions usually do not require a signature or PIN so long as they are under LL75,000, which saves time—a few seconds, but even these are valuable in today’s world. Secure contactless payments are enabled by near-field communication (NFC) technology, which allows two devices to communicate when they’re in close range. Newer host card emulation (HCE) technology allows cardholders to use mobile devices as credit cards, meaning a user doesn’t even have to carry an actual card around to make purchases. NFC and HCE are currently only available for Android phones; Apple Pay, a similar service from Google’s competitor, is not available in Lebanon. Worldwide, the growing trend is turning away from cash and toward cards and other more technologically advanced payment methods. For its part, Lebanon’s Bank Audi is aiming to guide its customer base into a cashless society. Bank Audi has been offering contactless cards since 2012, and by 2014, it had updated its NFC technology to allow clients to make secure payments using mobiles that are are NFC-enabled. For non-NFC enabled devices, it launched the same service via a sticker that attaches to any mobile. Today, the majority of Bank Audi’s newly issued cards are contactless. “Contactless cards are as secure as any other chip card and carry the same multiple layers of security,” says Walid Rizk, head of First National Bank’s electronic banking department and its consumer protection unit. The bank launched a smart mobile application in 2015 and started issuing newly designed payment cards in early 2017, including contactless cards. Its future plans include launching HCE tech. Meanwhile, Byblos Bank began using HCE technology in 2016 with its ByblosPay app, allowing users to pay at a contactless point of sale using Android smartphones that are NFC enabled. Head of Group Retail Products Elie Abou Khalil explains that these new payment methods are cutting the need for cash, or other methods of payment. Banque Libano-Française launched contactless cards in July 2017. Director of Card Services Myrna Wehbe says, “The world is constantly being challenged to find a replacement for cash, which today remains the preferred payment instrument for low value and everyday purchases.” She cites that since releasing contactless cards, 24 percent of the transactions customers perform with them are contactless and the bank expects this will grow. In August 2017, BLOM BANK launched BLOMPay, which allows BLOM Visa debit or credit cardholders to make payments via their eBLOM app on Android mobiles quickly, safely, and easily. Clients can choose which cards to activate and use their Android devices to pay. Lebanon and Gulf Bank has a wide range of card offerings that includes contactless cards. Since 2015, it has also been transforming mobiles into secure payment tools by offering mobile payments through its app—which includes, among other features, cardless transactions at ATMs using a one-time password—and it is further developing NFC technology solutions. 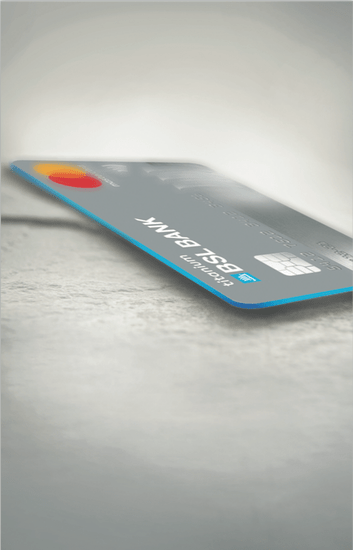 BSL BANK’s just-launched range of credit cards all offer contactless technology, each targeting a specific type of user. AM Bank, previously known as Al-Mawarid Bank, also offers contactless card payments on its range of credit and debit cards. Some banks also offer wearables that can be used to make purchases. Since 2015, Bank Audi has offered colorful wearable watches and bracelets, which provide an on-the-go payment solution that enables wearers to conduct contactless payments by waving them over any contactless POS machine. BSL BANK plans to enable payments via mobiles and wearables, with Paul Wehbe, head of cards and alternative channels, explaining that rolling out technology that provides convenience for clients aligns with BSL BANK’s digital strategy. Banks are not only offering technology and security but also a wider array of card options that cater to different types of users and their specific needs. Most banks have loyalty rewards programs to get cardholders to use cards more, offering various gifts, discounts, and benefits. As Lebanese often travel for work, many banks offer cards in different currencies. 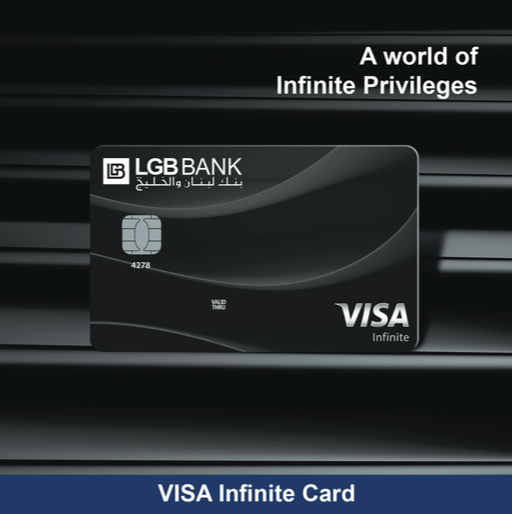 For example, LGB BANK offers cards in UAE dirhams, Saudi riyals, Turkish lira, euros, and pound sterling in addition to US dollars and Lebanese lira. 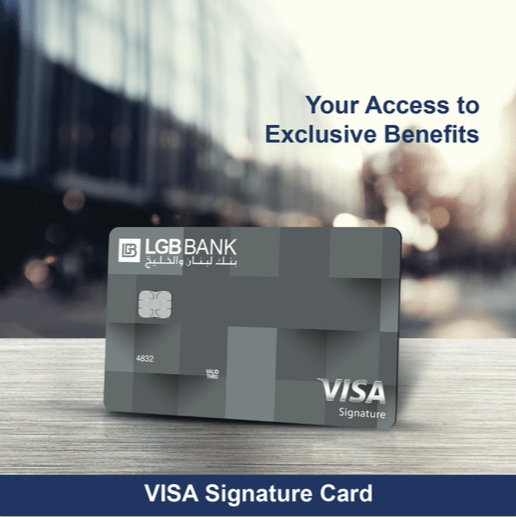 BSL BANK’s credit cards target segments like new card-users and active young people with a range of useful benefits like discount Careem rides, and those who want prestigious benefits and even more V’s in their VIP treatment with features like airport lounge access across the world. 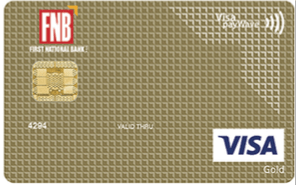 FNB’s Visa Signature Business Card offers innovative features especially designed for the business sector, like distinguishing business and personal expenses, simplifying account management, and offering special features like tax saving, unlimited access to airport lounges, and concierge services. Bankmed has added interesting features to its “Be My Guide” mobile app that not only accumulates miles but has a notification feature to guide users to airport lounges and partner merchants that offer complimentary services. Bank Byblos targets customers ages 18 to 24 with a specialized comprehensive package that includes an account and debit card, and has all the features this demographic needs, such as discounts with local businesses and an online debit card. Byblos Bank also makes it really easy to get a card in the first place with its instant issuance service that lets clients open an account, get a card, and instantly enroll in mobile banking and access various other services in a single visit to any branch. The future looks even more advanced. AM Bank plans to develop other electronic services, including person-to-person and person-to-merchant payments, cardless cash withdrawals, bill payments, transfers, splitting bills, or even e-wallets and smart cards. AM Bank’s product manager, Nicole Saade, says the bank’s marketing strategy is continuously evolving to embrace new trends and approaches in performing banking operations, and “consequently we are working to provide these services to our customers to meet the level of convenience they need,” she says. “Digital and mobile technologies are disrupting the traditional ways of doing business across industries, [including]in the banking sector,” says Walid Rizk of FNB. Byblos Bank’s Elie Abou Khalil stresses that their strategy is aimed at empowering clients. As we grow busier and increasingly connected, and as the demands of our lifestyles become more hectic and we become more dependent on technology, it’s reassuring to know that banks are responding to our changing lives and giving us what we want swiftly and safely.